If I'm right, the issue here is your divergance value. To be precise, I'd say the issue is that it's less than your track gauge. 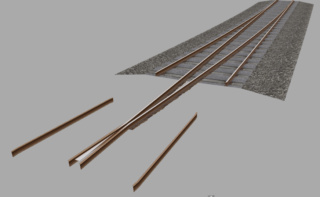 The termination point for each rail gets moved in the X-plane by this amount to produce the second track for the switch. Our outside rail starts at 0.8m & gets moved +1.16m ==> 1.96m ; This is fine. I'm guessing that the code has stretched the rails so that they end up outside the original line, but left the ballast at 25m length. I had a feeling that the divergence of < track gauge might be the culprit. I'll revisit it later today, I'd been working all day on a new route when I started the pointwork so was a bit past me sell-by! I made another article, with the divergence at 2m. This didn't extend beyond the 25m section length, but the rail tops weren't generated on the insides - I thought this bug was fixed before?? The problem with the first file is as I suspected. The second file is a little more complex, and has to do with the number of selected segments. You're using 10 segments, hence 2.5m per segment. 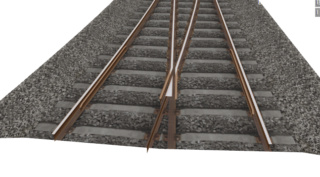 If you note, the railheads should start at ~23.5m, and as there's less than 2.5m between the toe of the switch and the end and so it's omitting the railheads. Need to think on this one to figure out exactly how to deal with it. Increasing to 20 segments will fix the issue, but this ought to be handled better internally. Well, if the railheads are missing I can at least try a different number of segments. I try and use the minimum consistent with a smooth look, much the same as cylinder faces. I suppose "x" crossings and double slips would be an impossible ask?? 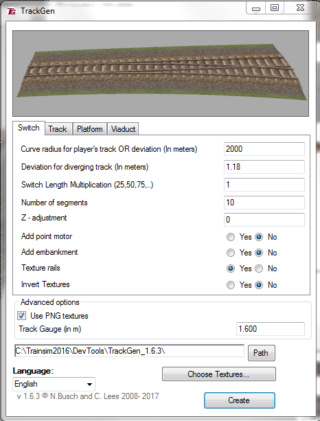 If you use the same track texture, those from Switch aren't *too* bad. 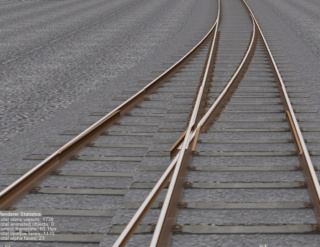 I've cheated in the past, if the crossover's not on the actual running rail, or too obviously visible, by letting the rails cross and dropping one of them by a couple of mm to stop "Y fighting". It looked better than a "Switch" item that I took ages to "doctor-up" - I gave up on that approach.